If you like carrot cake, you will love this recipe! Easy Carrot Cake with Cream Cheese Icing is chock full of pineapple, carrots, raisins, and because I’m a Southern girl, pecans. If this isn’t enough to get your attention, it’s then topped with a quick and easy, but decadent, luscious, and velvety smooth cream cheese icing. Read on for complete step-by-step instructions to make this scrumptious and moist Easy Carrot Cake with Cream Cheese Icing. There are probably as many carrot cake recipes as there are cookbooks, and that’s a lot. Most cooks have a favorite recipe, and there is also much discussion about which carrot cake recipe is the best. In fact, I attended a luncheon meeting of a cookbook club I belong to not long ago and our hostess, Carolyn Haley, served a wonderful carrot cake (Gateau Aux Carottes) she made which was moist, flavorful and covered with a delicious Cream Cheese Icing that included mascarpone cheese. We were cooking from David Lebovitz’s cookbook, My Paris Kitchen. There are a few things that all carrot cakes have in common: they are made with oil instead of butter, you don’t have to beat the batter as much as some cake batters, and they all include grated carrots. Some also include pineapple and raisins and some include nuts. 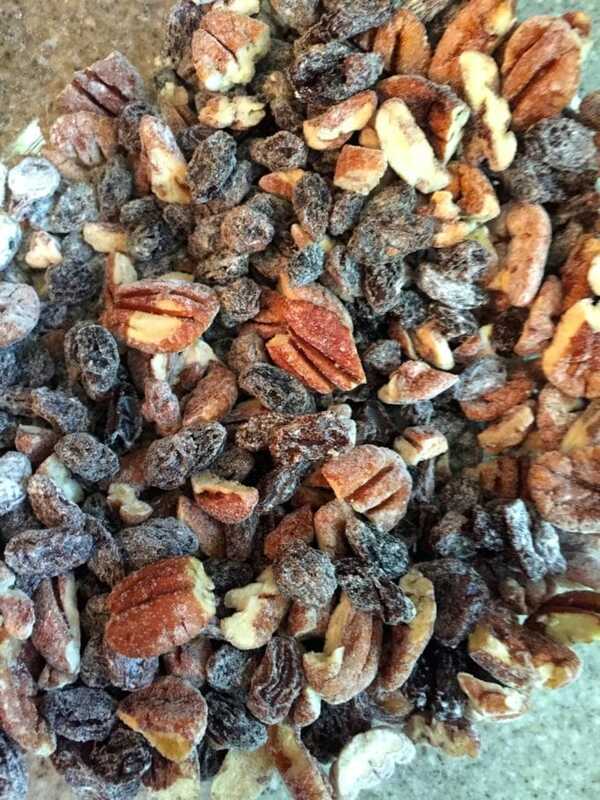 Pecans for sure if you are in the South, and sometimes walnuts or other nuts. Cream cheese icing is the classic icing on Carrot Cake, and all Cream Cheese Icing recipes include, you guessed it, cream cheese plus powdered sugar. The amounts and measurements may vary and some recipes, like Carolyn’s, may include other ingredients. 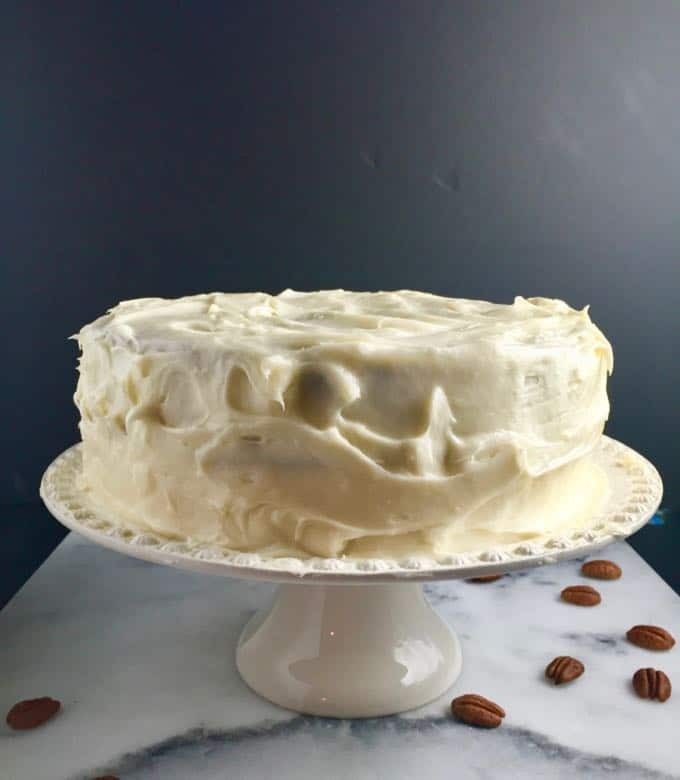 If you love easy classic cakes like this one, you might also want to check out these easy and delicious Southern-style cake recipes: Southern Pecan Praline Cake, Apple Dapple Cake with Caramel Icing, and Minnie Lee Croley’s Sour Cream Pound Cake. If you have been following my blog for any length of time, you know I am not much of a baker. Every time I bake anything with flour I end up covered in the white powdery stuff and our kitchen, well let’s just say it’s a mess! But this delicious cake is totally worth it, and if you make it once, it will become your go-to carrot cake recipe. I made this one as a belated birthday cake for my good friend Martha, and we all enjoyed every last bite. Happy Birthday, Martha! For the majority of my recipes, I usually tell you that’s it’s ok to substitute this and that and for most of my ingredient measurements, it won’t make that much difference if you eyeball it. But in general baking cakes is different, and it’s really important to measure exactly and follow the directions carefully. An ingredient not measured correctly, at the wrong temperature, or a missing ingredient can make the difference in a beautiful, moist and tender cake and one that well, just doesn’t turn out how you hoped it would. Fortunately, this easy carrot cake recipe is more forgiving than most cake recipes and much easier to make. 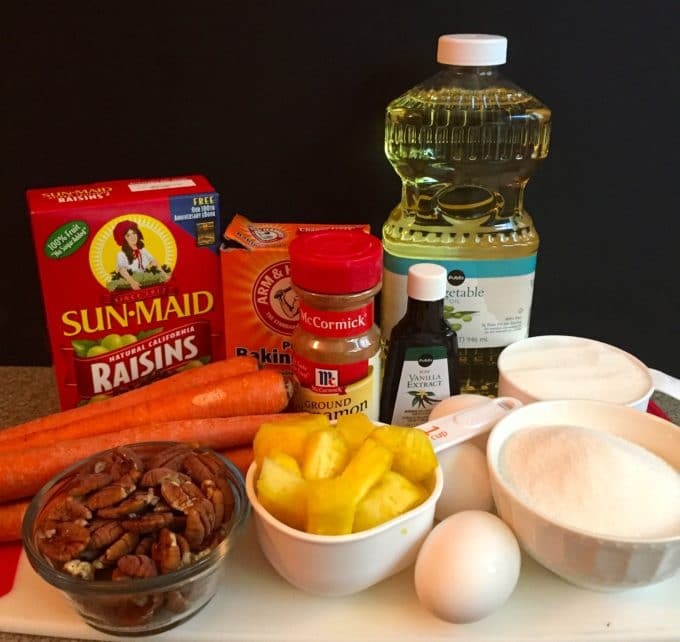 The ingredients for this easy homemade Carrot Cake recipe include granulated sugar, vegetable oil, eggs, vanilla extract, all-purpose flour, ground cinnamon, baking soda, salt, raisins, chopped pecans, a pound of carrots, and canned crushed pineapple. The Cream Cheese Icing ingredients are cream cheese, unsalted butter, vanilla extract and confectioners’ sugar. You will also need two 9-inch cake pans. If you are ready to make this extraordinary cake, gather your ingredients and preheat the oven to 350 degrees F.
Butter two 9-inch round cake pans and then sprinkle with flour. Tap the pans to distribute the flour and shake it around until it covers the pan. Pour out any excess. Or, spray with a non-stick spray especially made for baking. Set aside. 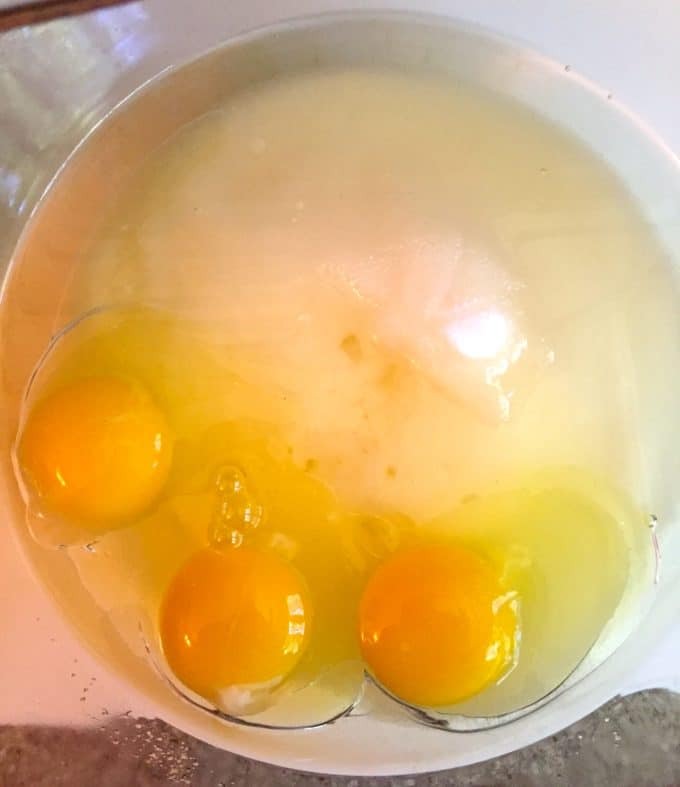 Add the sugar, oil, and eggs together in a large bowl and beat using an electric mixer until the mixture is light yellow. Add vanilla and mix well. In another bowl, sift together 2-1/2 cups of flour, cinnamon, baking soda, and salt. 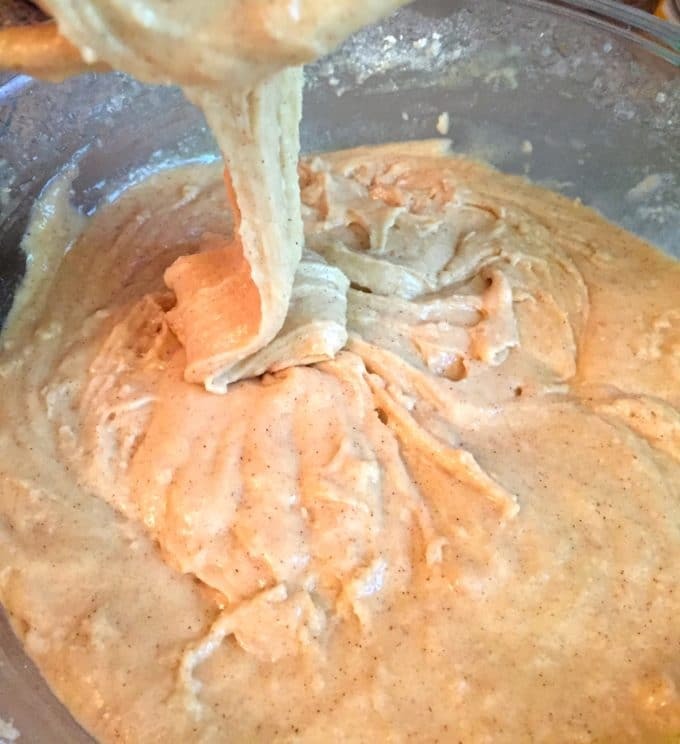 Add the dry ingredients to the wet ingredients and use your electric mixer to mix well. Add the raisins and nuts to a small bowl and sprinkle with 1 Tbsp of flour. Toss to coat everything. Fold the raisins and nuts into the cake batter. Add the carrots and pineapple and mix well to combine. 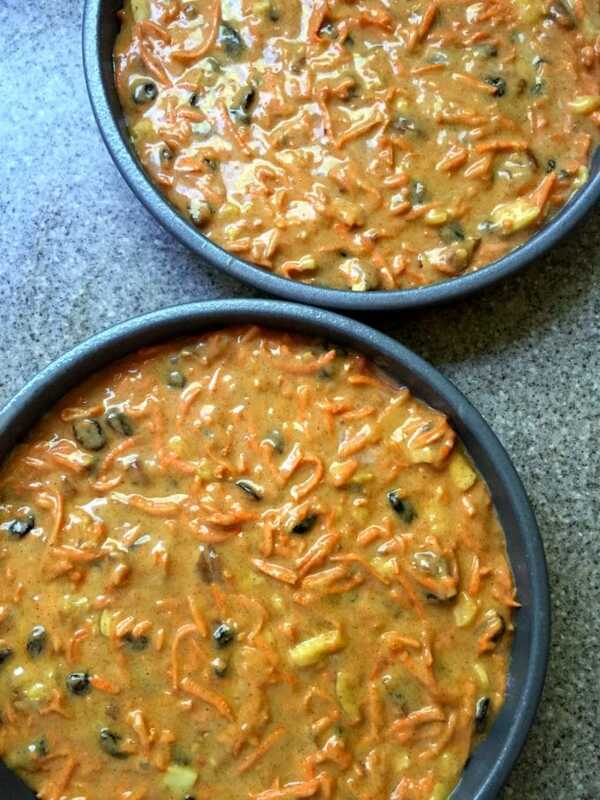 Divide the batter and pour into the two prepared cake pans. Bake for 55-60 minutes, or until a toothpick inserted in the center comes out clean. Allow the cakes to cool completely in the pans set on a wire rack. While the cake is cooling, gather the ingredients for the Cream Cheese Icing. 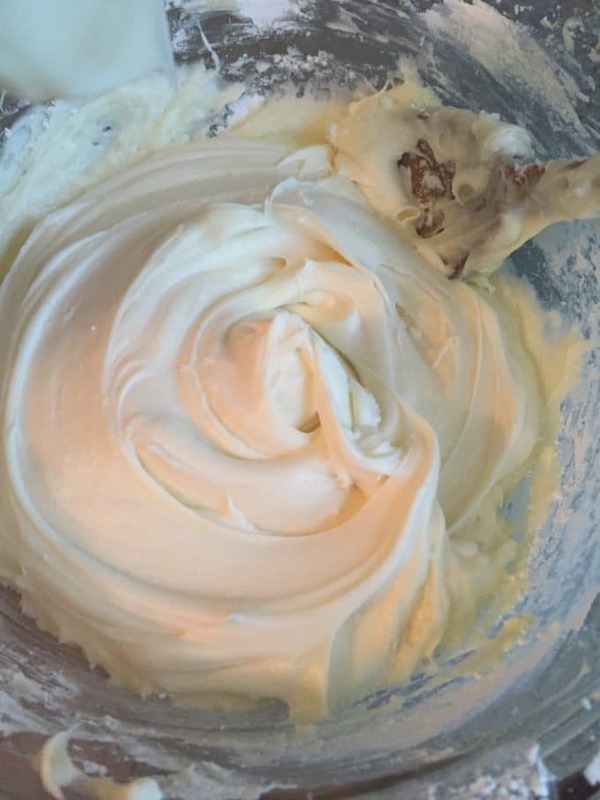 Use an electric mixer to mix the cream cheese, butter, and vanilla in a large bowl until combined and smooth. Add the confectioners’ sugar and mix until combined and the icing is smooth. To assemble your Carrot Cake place one layer of the cake, flat side up on a cake plate. Use a knife or offset spatula to spread the top with icing. Place the second layer round side up on top of the first layer. Spread the frosting evenly on the top and sides of the cake. 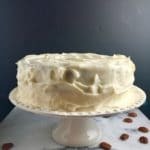 Easy homemade moist Carrot Cake with pineapple and Cream Cheese Icing is chock full of healthy carrots, raisins, and pecans. The recipe also includes a simple, decadent, luscious, and velvety smooth Cream Cheese Icing. 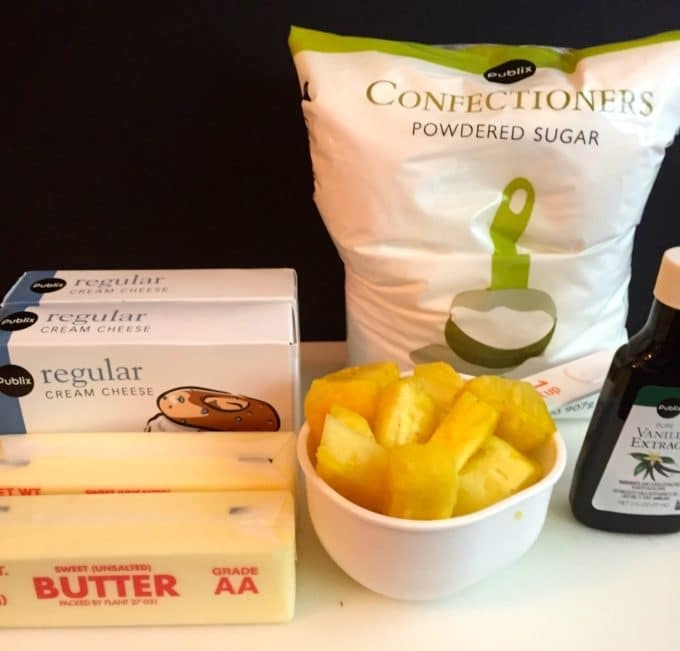 Add the sugar, oil and eggs together in a large bowl and beat using an electric mixer until the mixture is light yellow. Add vanilla and mix well. Add the raisins and nuts to a small bowl and sprinkle with 1 Tbsp of flour. Toss to coat everything. Fold the raisins and nuts into the cake batter. 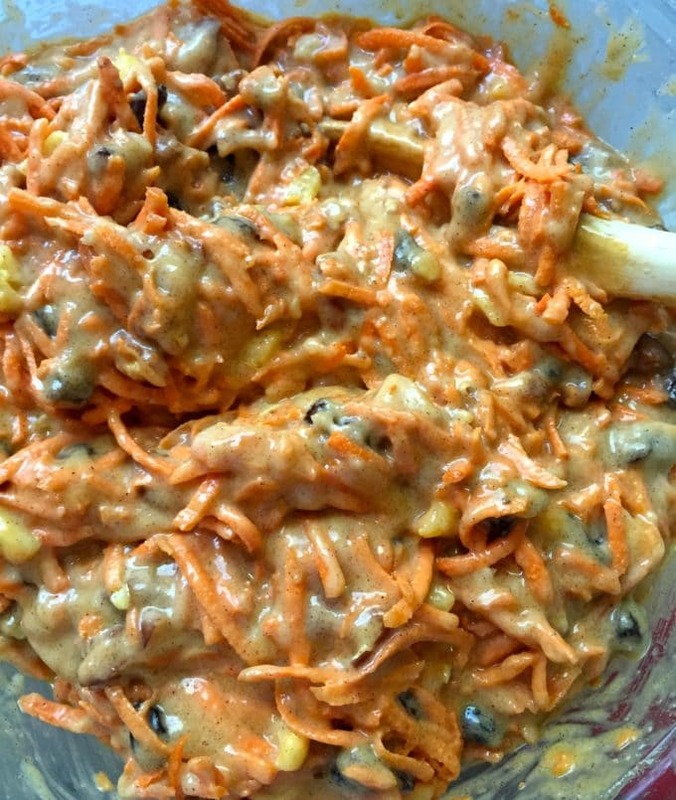 Add the carrots and pineapple and mix well to combine. Divide the batter and pour into the two prepared cake pans. Bake for 55-60 minutes, or until a toothpick inserted in the center comes out clean. Allow the cakes to cool completely in the pans set on a wire rack. Place one layer of the cake, flat side up on a cake plate. Use a knife or offset spatula to spread the top with icing. Place the second layer round side up on top of the first layer. Spread the frosting evenly on the top and sides of the cake.